William and Margaret Champlin sold for $600 to First Presbyterian Church trustees, a 71' wide strip of land on Front St by 250' deep along “Church Street” as was previously laid off by Wm. A Champlin and Mary Louise Caldwell. Trustees of First Presbyterian Church of PC agreed to sell the 71' Church Lot without selling the Church building which would be moved after Sale completion. The picture at right shows at left front, the Northrop Building with the Hancock Bank branch office with rounded columns to its rear. On the right is the Mexican Gulf Hotel which burned down in 1917. 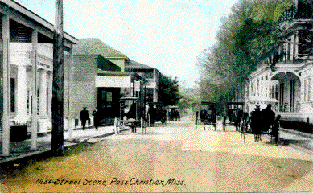 Trustees of First Presbyterian Church of PC sold the church lot measuring 71' fronting on Front Street by 250' depth along Church Street, later named Davis Avenue. The church building was not included and was to be moved within 60 days. Josie and Louis J Leger, MD (for outstanding debts) and for consideration of $5, conveyed to AK Northrop the 71' lot fronting on Front Street by 250' depth along Church Street later named Davis Avenue. The church building was not included and was to be moved within 60 days. 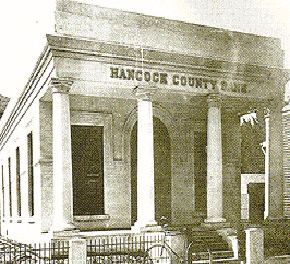 On April 29, 1902, the Hancock County Bank branched into Harrison County by opening an office at Pass Christian, which at that time, was a shipping point for cotton, wool and turkeys, as well as a thriving resort and seafood community.